After investigating the Stanley Hotel, I was anxious to go to another event. I saw this one at Dave's site and looked further into it. It did not focus on the ghost hunting but rather on developing and learning of your own psychic abilities. Of course, there was a private ghost hunt offered and I was excited to sign up for that as there would only be 10 people going! Now what had really caught my eye on this particular event was that Derek Acorah was to be there! AND! He was going to be leading one night of investigation at the Mounds Theatre in St. Paul!! How exciting! I had first seen Derek on the TV show, Most Haunted, when I first moved to Texas. I had been intrigued and thought I would love to meet him. Unfortunately, my friend from Nova Scotia could not make it. So I went up by myself. We were to stay at the Ramada Inn and now, it was not just any old Ramada either! Oh no! It was none other than the Grand Rios! Now if you are ever in Minnesota, you have to check this place out! I went up a day early for not only did I want to have a day to relax in the lagoon there at Grand Rios, but I also decided to stay a day later so I could enjoy the great shopping you always hear about at The Mall of America. Yes, I fully planned to spoil myself rotten! The hotel was offering a special deal for all of us who were attending the event and they gave us free passes for two to the waterpark that is INSIDE the hotel! I arrived at the Minneaopolis airport and this time, instead of renting a car, I thought to just pay a taxi or shuttle to take me up there. I knew all the events were to be at the hotel except for the ghost hunt but I thought I could just get a ride with another for that. I did also sign up for a reading with Chris Fleming. I had been very impressed with his class at the Stanley that he gave and I wanted to see how the reading might go. I had made the arrangements for it and I was to be his very first reading on the Friday of the first day of the event, just before the first class and gathering started. I would be paying in cash so Chris did not have any information about me, only my first name and my cell phone number. That was it. As I was there Thursday, a day early, taking a taxi on up, which was very expensive as this hotel is not all that close to the airport, I changed into my bathing suit and headed for the waterpark! This was really incredible! Amazing chutes and slides and the lagoon was just great! They also had quite a few sectioned off areas with hot tubs and a huge area in the middle for kids to play in like a tropical tree house type of thing. It was really, really neat! Many people brought their families with them and there even local people who came over just for the waterpark as remember, this is November! Brrr! But the water temperature was great and the staff are all super friendly! My room was gorgeous! Friday, the vendors arrived to set up their tables in the main courtyard of the hotel. Chris got in late with his flight and called me to ask if he could meet me a lil later since his flight was delayed. So no problem, I got to see him later on and as I walked around there to each vendor, I saw Paranormal Sarah! I went right on over and talked with her for a while. I had spotted Chris and he looked over and I must have seemed somewhat familiar and so I walked over to him and confirmed that yes, I was his first appt. :) So he went to get things ready and took me off to his room where it was quiet and we could do the reading. Chris had a pad of paper and pen and he set to writing, taking notes of his impressions and what was coming thru to him. Again, I clammed as much as I could. I always feel a bit funny going to see a psychic or medium for a reading. Most ask you why you are there or what question you wish to ask or what you are wanting to know. I never know exactly what to say for there isn't a whole lot I want to know from the other side. But, he touched on several things that again, he had no way of knowing as he did not even have my address or full name or anything. Chris Fleming is a nice soft spoken man and I had a very nice reading with him and he shared a few insights with me. 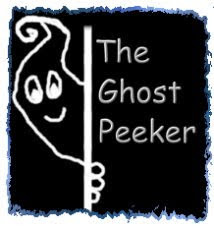 For those who do not know of Chris, he has been on the Dead Famous, Psychic Kids and has done a few episodes of Ghost Hunters and Ghost Adventures. He's been to many of the paranormal events as well and leading investigations. The Stanley Hotel/Nov 2008, Extras!